Photographer Diane Covert sheds light on victims of terrorist attacks with her exhibit featuring x-ray photos of the victims. After a terrorist attack, it seems to photographer Diane Covert, victims are forgotten in the rash of questions about perpetrators and motives. 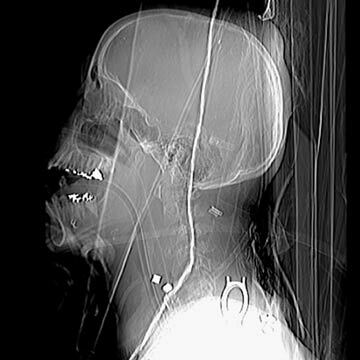 For her exhibit “Inside Terrorism: The X-Ray Project,” Covert collected images from two medical centers in Jerusalem and transferred them to Duratrans film so they could be viewed in daylight. The grotesque effects of homemade bombs appear in neat clinical detail: a nail in the throat, hex nuts in hips and, as shown, a watch that partially severed the victim’s carotid artery and lodged in her neck.